Are there additional fees such as “co-payments”? No. There are no hidden fees, co-payments, or deductibles. However, for services outside of the concierge program, such as labs, medications, imaging, etc, your insurance company may impose these. No member will be excluded on the basis of a pre-existing condition. Does this replace my health insurance? No. Dr. Toll’s membership program will provide you with unparalleled primary care and urgent care access and services, but the fees do not cover hospitalizations, ER visits, labs, imaging, medications. We are NOT an insurance company. We certainly recommend that all patients have insurance for things like medications, imaging, specialists, hospitalizations. That being said, you are still able to be a member of our practice if you do not have insurance. In fact, we can get discounted labs and imaging done for you do not have insurance. What if I get sick away from home? As a member of the practice, we will be able to use our electronic medical records to both send prescriptions as necessary, as well as coordinate care and securely share records as appropriate with local physicians wherever you may be. In a true emergency, you should call 911. Once you have done that, please let Dr. Toll and his office know, and he will help expedite the process at the ER and Dr. Toll will help guide your care during your hospitalization. Is membership only for when I get sick? Absolutely not. 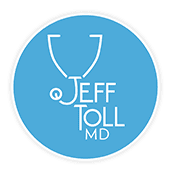 Dr. Toll focuses on preventative care, wellness, and making health goals that he helps empower you to achieve. How fast are phone calls and texts typically answered? Aren’t you busy? Typically, within about 10 minutes, unless I happen to be in a room at that moment with another patient. Typical primary care physicians care for about 2500-3000 patients and are therefore forced to see about 20 patients/day. Using our membership-based system, we have less than 10% of the patients so that we have 10 times as much time per patient. Do you accept 3rd party insurance or Medicare? No, The membership includes patient access and services that are not covered by insurance. That being said, as stated above, your labs, imaging, medications will all be covered as they normally would. Is there some tax advantage to membership in the practice? Yes. You can pay for the membership fees out of “pre-tax” dollars from a Health Savings Account. Many clients also “expense” these fees through their businesses. Please consult a tax advisor for specific details regarding your situation.